This article is a guest post by Mari who has been keeping fish for more than 4 years. She is the owner of Aquariadise where she blogs about aquarium tips, guides and more. Blackwater aquariums are something most aquarists have seen before, but few have tried. The dark water, scarce planting, and leaf litter are not for everyone, but can make for a beautiful aquarium, when properly set up, while being perfect for anyone who likes to recreate natural habitats. What is a blackwater biotope? An aquarium with water so dark most plants cannot thrive and fish are practically invisible may sound senseless to some, but there can be many reasons to invest in this type of tank. 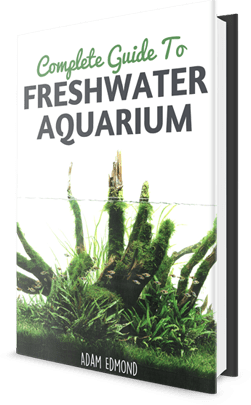 Most aquarists know many popular aquarium fish actually dwell in stained, soft, and acidic waters, and attempting to recreate these habitats can be a fun and challenging project. It can also be beneficial for the fish, especially if caught in the wild; being in a more natural environment without bright lighting helps keep their stress levels down and can be crucial when trying to breed some species. There are many different blackwater biotopes that can be recreated in an aquarium; even if you’re not interested in copying nature exactly, you can still produce a wonderful aquascape by combining different elements. 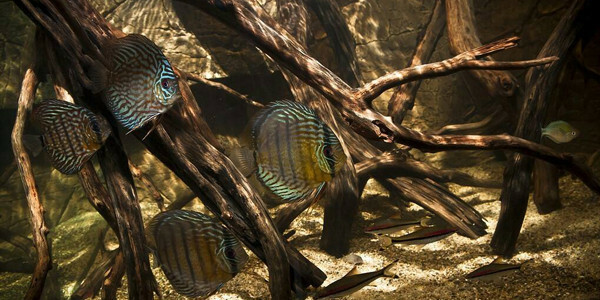 There are, however, a few things that almost all blackwater aquariums have in common. The first is obviously the dark water. “Dark” can range from a slightly tea-colored tint to very dark brown. The color is caused by tannins, which naturally occur in plants, thus, the more leaves, branches, and other litter that falls down in rivers, streams, and ponds, the darker the water will become. The same goes for aquariums! This is the reason a lot of driftwood is usually used in these setups and there may even be decaying leaf litter on the bottom. Another similarity in blackwater aquariums is the water is soft and acidic. Plants are usually scarce and sometimes skipped completely, but if you like a planted tank there are still plenty of options when it comes to blackwater setups. When setting up your own blackwater aquarium, there are three things to think about beforehand: water chemistry, fish/inverts, and plants/decorations. It is important to think about the chemistry of the water because a real blackwater biotope has soft, acidic water. While the tannins may help bring the pH down a bit, you may have to consider looking into using reverse osmosis water if your tap water is very hard! Matching the real pH of blackwater rivers and streams may be a bit unrealistic, as it can be as low as 4.5, but 7 or lower is a good idea if you want to make your fish and plants feel at home. You can achieve the blackwater look in your home aquarium using leaves (Indian almond or oak), driftwood, or alder cones. Leaves and alder cones can be soaked, boiled, and filtered to create a strong blackwater “extract,” but you can also just spread them along the bottom of the tank and they will gradually darken the water as they would in a natural river or stream. The species of fish for a blackwater aquarium should be carefully researched beforehand, especially if you are recreating a specific habitat and only want to keep fish that naturally occur there. Use websites that list their natural distribution and preferred aquarium set-up. SeriouslyFish is a good resource for a start. If you’re going for a “general” dark water setup, any fish that prefers soft, acidic, dark water will work well. Just don’t get so caught up in finding the perfect fish for your biotope that you forget they should all be compatible with each other and suit your tank size as well! For example, discus fish and neon tetras are both species that work well in blackwater, but that doesn’t mean they should be combined—the tetras would most likely end up as their tankmates’ dinner. It is also important to think about the plants and decorations if you want to create a realistic blackwater biotope. As with fish, you should keep in mind the natural distribution of plants if you really want to copy an actual habitat. If this is not important, be sure to choose plants that don’t need very strong lighting, as the darkness and possibly floating plants mean not all of the light reaches each plant. Low light plant species like Anubias, Java fern, and Amazon sword will do well in a blackwater aquarium. Floating plants like Amazon frogbit can really help create a natural look with its long, flowing roots. 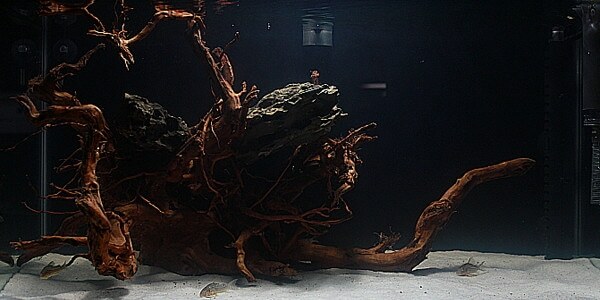 Another component that is considered a “must” for blackwater tanks is driftwood. Before setting up the tank, think about what kind of driftwood you want to use. As mentioned before, you can also add loose leaves and/or alder cones on the bottom of the tank for a natural look. All in all, setting up a blackwater aquarium is a great project for both beginners and more experienced aquarists. The possibilities are endless: blackwater rivers, swamps, and ponds are found all over the world and all contain different wildlife. The result can look fantastic and fish species that are from these waters will thank you by displaying their natural behaviors and possibly even producing offspring when they normally wouldn’t! Is a filter necessary for a black water tank or would water changes be sufficient? Yes, a filter is required for blackwater tanks. 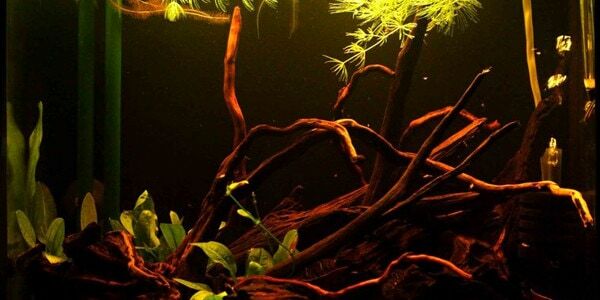 To avoid the Tannins being pulled from the water and losing the blackwater effect of the tank, do not keep any type of carbon in the aquarium. I have an 185 gallon long set up as black water. Love it and could use some advice. I added two quite large dead oak root structures and I was wondering, can the water contain too much tannins to the point of hurting my fish?